Today, we are going to admit that it would be fun to try to be healthier for the holidays. This post and recipe comes from Appetite for Health, a website written by two smart women, Julie Upton, MS, RD, CSSD, and Katherine Brooking, MS, RD. As registered dietitians (RDs), everyone wants to know what they eat, their favorite new foods or how they eat right when they are traveling or eating out. On Appetite for Health they share with you – bite for bite – how they strive to eat healthier in the real world of food. Part of my fondest memories as a child was making holiday cut-out cookies with my mom and sisters. When they weren’t looking, I’d purposefully break off pieces of the cookie stars, candy canes and Santas so I could eat the “damaged” goods. (My mom did eventually catch on!) So when Jamie N. from Baltimore, MD, emailed us about how to make a healthier cut-out cookie, we thought what a great idea and we haven’t seen any better-for-you versions of the buttery-sugary-holiday fave. We called in our dietitian recipe expert, Kit Broihier, MS, R.D., to work her magic. Holiday sugar cookie cut-outs are a holiday tradition in many homes, and decorating them with kids (or friends) is a fun way to ring in the season. The butter-heavy dough and sugary icing to start, and add in the calories from the often over-the-top edible decorations and these festive sweets can take a dent out of your calorie budget. There’s nothing in them that’s healthful—no fruit or nuts to justify those calories—just refined flour, lots of butter and sugar. Nutritionals per standard cut-out sugar cookie with icing: 130 calories, 7 grams fat, 13 grams sugar. White whole-wheat flour was used for most of the all-purpose flour. Combined with just a little unbleached all-purpose four, this switch added fiber without making the cookies too heavy in texture. Also, using the white whole-wheat helped keep the color of the cookies lighter than using regular whole-wheat flour. Butter was cut way down (most recipes use at least 1 cup butter) to just 3 Tablespoons. Since there are few ingredients in this recipe in the first place, these cookies rely on butter for flavor. We also used a Tablespoon of canola oil, but found that using only oil made the flavor of the cookies very flat and just not that appetizing. Then, to boost the flavor even more, we browned the butter first. Sugar was reduced, and we used more flavorful brown sugar instead of white sugar. Spices were used to boost the flavor and add antioxidants. We happen to like the more complex flavor of these cookies, which utilize nutmeg for a seasonal touch. If you’re not a nutmeg fan, you could sub in cinnamon, or just increase the vanilla extract to 1 teaspoon. Finally, we decorated our cookies just with a small amount of “sanding sugar” (a fancy term for large-crystal colored sugars used for decorating) prior to baking (press it in a bit so it doesn’t all just roll off when the cookies cool. 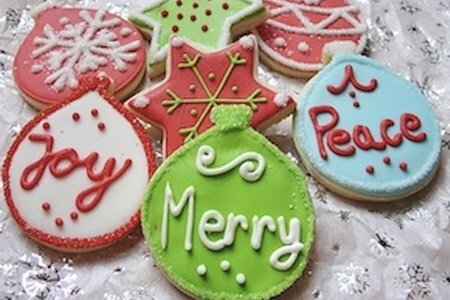 You could also use a small amount of icing to outline the cookies or add some dots, lines or squiggles to your cookies. Just avoid covering the entire cookie surface with powdered sugar icing—it’s too sugary and rarely tastes good anyhow. Our cookies came out moderately crisp (if you like them really crisp, just bake them longer) and the dough was easy to roll out and handle. Aside from the slightly darker color of the dough (the baked cookies end up being only slightly darker than the typical sugar cookie), we doubt that anyone will even notice your healthful switches to this classic cookie. With these changes, the calories are cut in about half, the fat is kept to a minimum, we add some protein from the whole grain flour as well as fiber. In a medium bowl, stir together the flours, baking powder, nutmeg and salt until well combined. Set aside. In a small skillet over low heat, melt the butter. Heat until lightly browned and fragrant, about 1 minute, swirling it or stirring occasionally so that it doesn’t burn. (Do not leave the butter unattended or it WILL burn—browning doesn’t take long.) Remove from heat and let butter cool slightly. Using an electric mixer, mix the browned butter with the oil, egg, brown sugar and vanilla extract in a bowl until blended. Add the dry ingredients to the butter mixture and mix on low speed until combined. Gather the dough into a ball, flatten it into a disc shape, and wrap it in plastic wrap. Refrigerate dough for at least 1 hour, or up to 2 days. When ready to bake, remove dough disc from the refrigerator. Preheat the oven to 350 degrees. Coat two baking sheets with cooking spray, or line them with parchment paper. Roll out cookies on a lightly floured surface to 1/8-inch thickness. Cut into shapes. Transfer cut-outs to the prepared baking sheets (you may want to flour your spatula—it helps cookies slide off better). Sprinkle cookies with sanding sugar, if desired, and bake for 6-8 minutes or until edges are lightly browned. Remove and let cookies cool for 2 minutes before removing them from the baking sheets. Cookies should be stored in air-tight container for up to a week, or frozen in layers with waxed paper between. Recipe from Kit Broihier, MS, RD. Thank you so much for this post! It's great to have a healthier version of a Christmas favorite!! Can't wait to try them! Glad you liked the recipe, Lisa! It sounds an interesting recipe to try. I would be tempted to add quite a bit more spice though, perhaps some ginger. Can't wait to try this as I usually don't make cut out cookies because of the time involved, but I have the cookie cutters from my childhood that I am going to get out and make this recipe. Thanks, this sounds good. Only change I will make is to use Whole Wheat Pastry flour, which I think works better for baking. Like many, I grew up making sugar cookies with mom as a tradition. We added raisins to our snowmen cookies as their buttons - a little better then icing. Raisins are quite yummy once they are baked in the oven with the cookies. I can't wait to try this recipe with the snowmen cookie cutter! Thanks for sharing. These look great, Lisa!! Thank you for sharing with us as always :) Do you know if you could use coconut oil in place of canola? I am very new to coconut oil so I'm not sure when you can/can't sub it in! I'd recommend coconut oil in place of the canola! FANTASTIC! Thanks for posting! Now with them being only 1 PP per cookie, I have to hope I don't eat the entire batch! My new favorite oil - coconut oil. Use it for baking, cooking, as a skin and hair moisterizer. A wonderful spice to add to cookie batter is to flavor it with ground cardamom. I'm new at making cookies. Will definitely try these. Thanks. Sounds wonderful! I'm going to try decorating with cashews in star patterns. I'll bet there are other healthy deco tops! These were fantastic! I cut them into snowflake shapes and very lightly dusted them with powdered sugar. My family and a friend's family loved them. This will be my gift to all my neighbors this year in a pretty tin with a recipe card printed on top. Thanks so much for the recipe! No NO Coconut oil has the highest saturated fats. 92% in fact.Canola oil 6% the lowest. These sounded so good! But something must have gone wrong - they were like cardboard. Don't worry, I will be trying again! I made these last year and they were very, very good. We all loved them! Also, most other veg oils turn good cholesterol into bad at high temperatures when they oxidize and become rancid. Coconut oil can take extremely high temps without oxidizing and organic coconut oil appears to be the healthiest. In addition, most veg oils(especially canola, soy and corn) are (GMO) genetically engineered. And, using a sweetener made from natural fruits like Swerve (New) or Nectresse and also Stevia I believe are better than sugar and no carb for diabetics. My grandmother lived into her 90's and was never sick. She and my grandfather owned an Angus cattle ranch, often eating meat which, has saturated fat, for all her life and using lard or (Crisco), also, which had saturated fat in the old days, to cook with. She never smoked and had one whiskey sour in the evening. I think we need to be aware that many commercial foods are altered today which is good for some foods and not so good for others.